We're always making all sorts of improvements to DTS Play-Fi, but this time, there's so much, we had to make a special post about it. There's a lot here to enjoy, so we'll get right to it! We have a dedicated news article for this already, but we're officially launching on both Android and iOS with this new update. 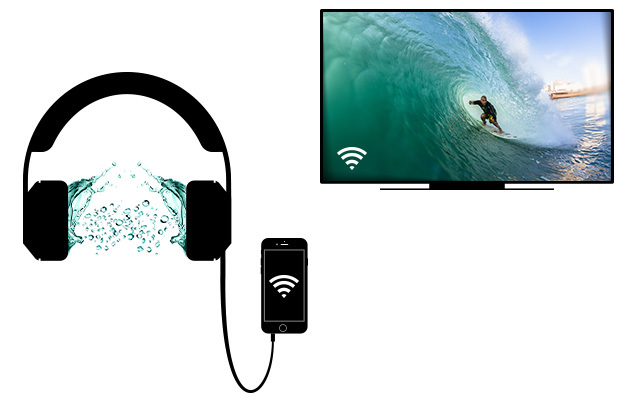 This new feature is part of a brand new app called DTS Play-Fi Headphones, and allows users to connect to compatible DTS Play-Fi products to stream audio from an on-device input source and maintain sychronization between the audio and that original source. You can even have multiple apps connected to the same source at the same time.
. . . and more coming soon! If you have one of these products, but don't see it showing up in the list in the app, contact your manufacturer and they can be sure to get you updated as needed. 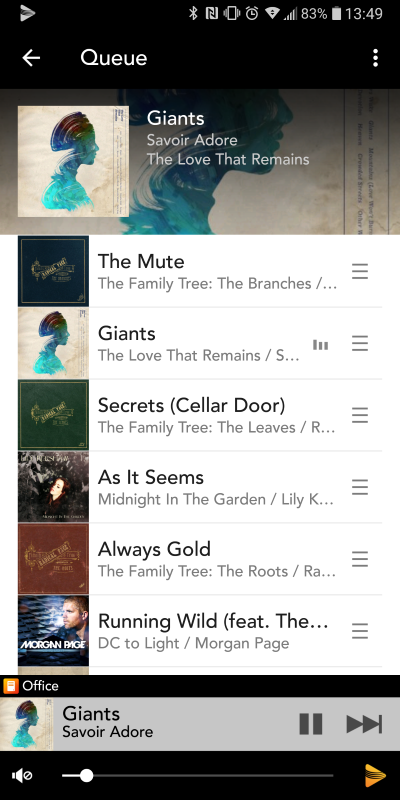 If you find yourself playing a lot of the same stations, playlists, etc., this set of features is for you. The app can now store your play sessions as "scenes", so that you can easily tap and recall them. Whatever content you were playing, however you were playing it, and in whatever configuration around your house, it can all be stored to the app for a quick and easy way to get the music going. Any time you want to save a preset, just tap the Save Preset button on the Now Playing screen or the zone module itself, and the app will capture the current session for recall. Of course, if you'd rather have something more automated, the app also remembers whatever last you were doing in a session, and stores that in history under "Recents". Just like Presets, if you tap on any of these, it starts up automatically. Super easy. We've gotten a lot of requests to add the ability to queue music across more services, and with this new update, we're doing that. On Android, now not only can you queue Music on your phone/tablet and from music services like Tidal and Napster, you can now also queue in your local Media Servers. While browsing, you can tap on the option button to place any track or album into the queue in your specified order, edit the queue dynamically while it's playing, or just clear it entirely and start fresh. On iOS, we decided to take it one step further. Not only can you now queue music in pretty much all of the available track-based services, you can create a queue that blends the tracks from different services together. If one service has a lot of tracks, and is just missing one or two, you can add in something from your local collection, or even another service, and playback doesn't have to stop. Feel free to keep the music going. Set it and forget it. For a while now, if users started a stream from their application, the controls for that zone would be made available to the system on the phone/tablet, which means you'd see controls and metadata in the notifications, lock screen, or even on connected smart devices such as smart watches, etc. The system would understand that this is the current zone that's "in focus". Of course, this was just for zones you started yourself on your phone/tablet. Now the zone that's In-Focus can be automatically shifted based on your activities, thanks to the newest update. You'll notice that any time you do any activity over a zone in the Play-Fi Control screen (the default screen when you open the app) or even just scroll over it, you'll get a little highlight along the sides of the zone module, and this will indicate that we're sending this up to the phone/tablet system. And it doesn't mater where this content is coming from, so Spotify Connect or even Amazon Alexa sessions can be controlled from your notifications, lock screen, or even smart watches. No matter what you're doing, we're making it easier for you to make adjustments with just a touch. We've added another streaming service to the app, and this one has a focus on business. 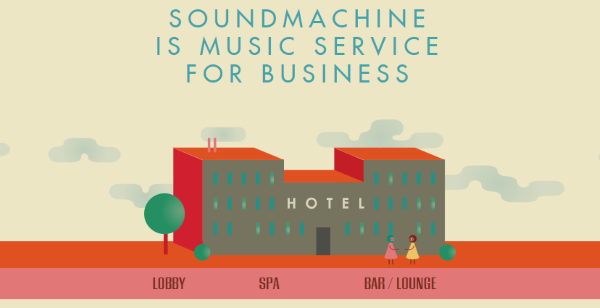 Within DTS Play-Fi, we have support for business accounts on a few of our music services, but SOUNDMACHINE is designed primarily and exclusively for businesses. With SOUNDMACHINE, you can customize and tailor the musc experience entirely to the image you're trying to create for your place of commerce. No need to constantly manage the playlist: Set stations and customize the mood and theme of the music, and schedule days or certain hours for different types of music. You can fine tune your content, and even import and program special messages to compliment your business. If you'd like to see more, Click Here for more details and a Free Trial offer!
. . . And lots of improvements and fixes! As always, we're working diligently to fix issues and improve overall performance across the board for the DTS Play-Fi platform, and this update will see a whole host of improvements and fixes to issues that we've found and have been reported to us by our users. If you're curious about some of the more complex features listed above, you can check our Knowledge Base, which has sections dedicated to the Presets and Amazon Alexa features. You can also e-mail us directly, or even just comment below. We want you to know that we do absolutely read everything and are listening, even if we don't have a reply to every comment in the moment (we try to comment as much as we can), so please do share any and all thoughts you have with us so that we can continue to improve DTS Play-Fi together. Hi when can we expect some simple EQ controls especially for the paradigm PW amp? This is something we discuss internally, but not something you may be able to expect in a new feature for some time. As you may already know, DTS Play-Fi is primarily a transportation method and facilitator for audio, and we try not to touch or adjust the audio wherever possible to preserve the premium listening experience most people expect from our audio partners. This means that if adjustments are made on the audio, it is done so from the host product. The PW Amp is a good example because they make use of the Anthem Room Correction platform to adjust their tuning to better suit the room. This ensures the best possible reproduction experience. We don’t want to dictate how one of our partners’ products should characterize or control their audio, so we’ll generally try to leave it up to them. It’s their sound signature, after all. This doesn’t mean we’ll stop considering ways to do it that preserves the audio integrity, but for now, we trust the legacy of our audio partners. question will you be adding tunein radio to dts playfi app we want tunein because alot of the stations on tunein radio are not listed on iheart radio.my local radio station streams on tunein radio not on iheart radio. I live in Canada and have several Klipsch DTS Play-fi products (The Three + 2 x RW-1 speakers) and wondered if there is any update on when Amazon Music will be supported for streaming over DTS Play-fi in Canada. I believe Amazon should be making this available for us in the coming months, and it will be expanding to even more regions at the same time. I believe their intention was to take care of as much as possible in one fell swoop. Justin, thanks for the update. Do you expect ‘coming months’ will translate to a 2018 announcement. Thanks again for your update. Any update on when Play-Fi / Amazon Music will be available for Canadian users? Some great new features here! Is it possible to sort my Tidal favorite artists, favorite albums, and favorite tracks by “date added”? It used to default to that, but is now alphabetical. I’d love to have both settings, but when it comes to listening to new releases, and discoveries, I rely on sorting by “date added”. Are you working on the Pandora service in the iOS app to offer some of Pandora’s normal iOS features? Mainly scrolling through last played tracks to thumb up/down or possibly replay (as in Pandora app)? Can’t always get to the app while a track is playing. Why can you not play Apple Music selections on your app? I also do nott understand why we can not get the shuffle feature to work on Amazon Music. Why is the button there if it has never worked? I have several questions regarding Play-Fi as implemented on my Onkyo TX-NR777. Onkyo has no answers to these questions. * I am an Amazon Music Unlimited subscriber. 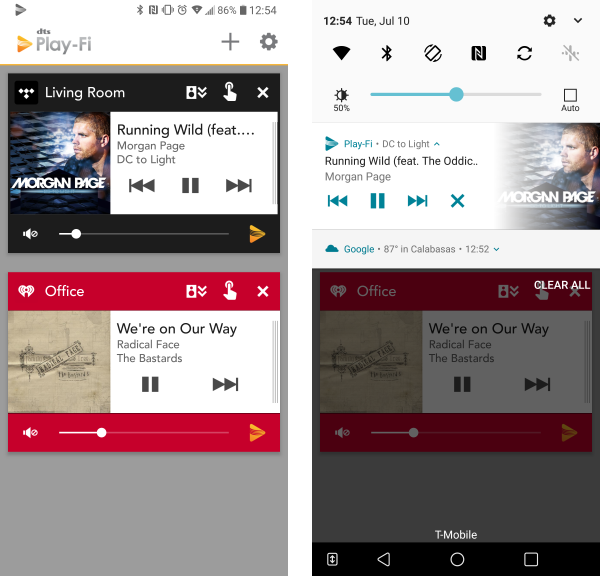 The Amazaon Music app on Play-Fi is missing a plethora of features contained in the Android Play Store Amazon Music App. The ones I am most concerned about relate to audio streaming quality. In the Android app, you can choose “best quality” in the audio settings, so that when I am using the Chromecast built in to my receiver, I am receiving the “best quality” stream from the Amazon app—in Amazon’s case, 256 bitrate (I have a 100 mbps FIOS connection, so I have a ton of bandwidth available). But there is no way to set the audio quality in the Play-Fi Amazon Music app. So what bitrate is Play-Fi streaming at given my 100 mbps FIOS connection? What determines the streaming quality Play-Fi uses on my network? How can I tell what the quality/bitrate of the audio stream is? Will Play-Fi add an audio quality settings functionality so that I and others can be assured we are getting the “best quality” that the Android Amazon Music app provides (as well as other apps, such as Deezer, which, like Amazon, are missing entirely the audio quality setting in the Play-Fi app, but you can choose “High Quality,” which is 320 bitrate, in the Deezer Android Play Store app)? 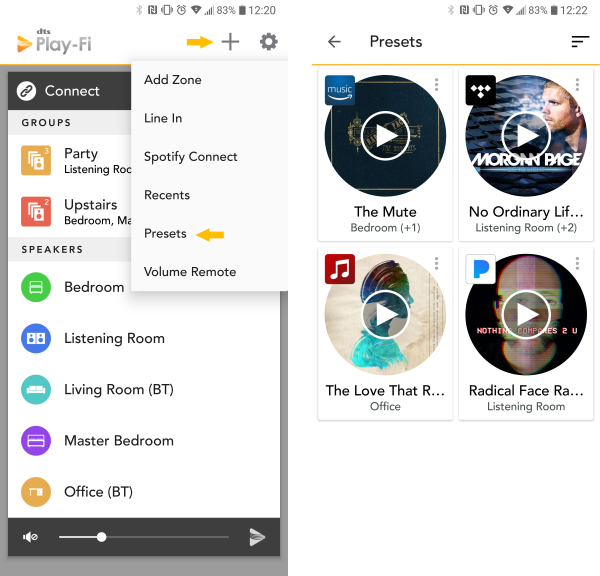 There are other features missing from the Amazon Music Play-Fi app, with the biggest being Alexa. I have a Firestick, and simply cannot use Alexa in the Play-Fi Amazon Music app. With the Android Play store Amazon Music app, Alexa is voice-activated, and I can either listen on the phone or stream to the receiver with Chromecast using Alexa. When will Alexa be included in the Play-Fi Amazon Music app so that it will have the same functionality as the Android Play Store app? Hi there, are there any plans to enable Gapless playback through Play Fi devices. I have a Polk Omni music streamer and it works really well, but I would really like to be able to play gapless from Tidal and Spotify. Yes I too would like to have your support for hapless playback. I’ve been using Play-Fi for four years now, and still no gapless playback. When will you finally implement that feature??? It’s very annoying be listening to, say, Hamilton, and hearing interruptions in the music as it moves from one track to the next. I don’t understand why this isn’t a higher priority for you. Plenty of other mp3 players have this feature. Why is there no support for playing Apple Music? Is this a technical issue that has never been resolved, or has XPERI simply decided not to make a deal with Apple? Based on the lack of comments on this page, it’s fair to say that Play-Fi isn’t a very popular service. I’m guessing this could also play into the lack of support and quality of product. Apple Music is something we’re interested in adding support for. We’re speaking with Apple on a multitude of different topics right now, and they’re a great partner, so it’s our hope to figure out something that works both technically and on the business level. Even if we don’t respond to every message, we always read everything and discuss it internally. Hi, I’m just deciding to buy the Anthem MRX 720 receiver, which uses DTS Play FI to play and the absence of gapless bothers me.